I've been waiting for this last installment in the matched trilogy. I loved Matched. I didn't care for Crossed. 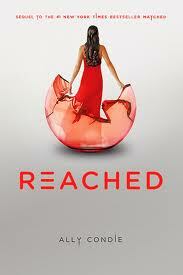 I wanted to know what happens in the end with Reached. I have a few issues with it. It is quite slow. Very poetic. I like poetry, but I was looking for more action. I mean a rebellion was happening wasn't it? You wouldn't be able to tell for how peaceful it was. To tell you the truth. I'm concerned with the lack of world building here. If you're going to write dystopian/science fiction then you need to get into the details. I want to know what this world is like. What is there or not there. What are the people like. How are people being controlled? I just needed more. I really did. While I did enjoy this story, it definitely isn't my favorite. I didn't connect with Cassia during this book but I LOVED how it was written in Cassia, Ky and Xander's points of view. I loved knowing each chapter was bringing me a different version of the story. That is what kept the story going for me. I won a copy on Twitter from the publisher. I haven't received it yet though! Therefore, I didn't read your review! I'll come back! Thanks for giving a candid review, it isn't always something that people are willing to do. I personally pride myself on an honest review.